Blockage won the New Currents section at the 2017 Busan International Film Festival. Faced with losing his job and his family on the same day, a shady municipal officer in contemporay Tehran is forced to make some difficult choices in Blockage, Mohsen Gharaie’s gripping social drama. Qasem (Hamed Behdad) is tasked with monitoring the street vendors who peddle their wares on the streets of Tehran. He regularly supplements his paltry income by taking bribes and backhanders from these even worse-off salesmen, but now risks losing his job over his nefarious dealings. Forced to live in his parents’ house, Qasem’s domestic situation is far from ideal, and his wife Nargess (Baran Kosrari) is coming to the end of her tether. She wants to use her inheritance to buy a house, but Qasem is determined to spend the money on a truck he can use to make more money. His problems come to a head when a vendor (Nadar Fallah) accuses Qasem of assault, drawing him into his own spiralling web of problems. 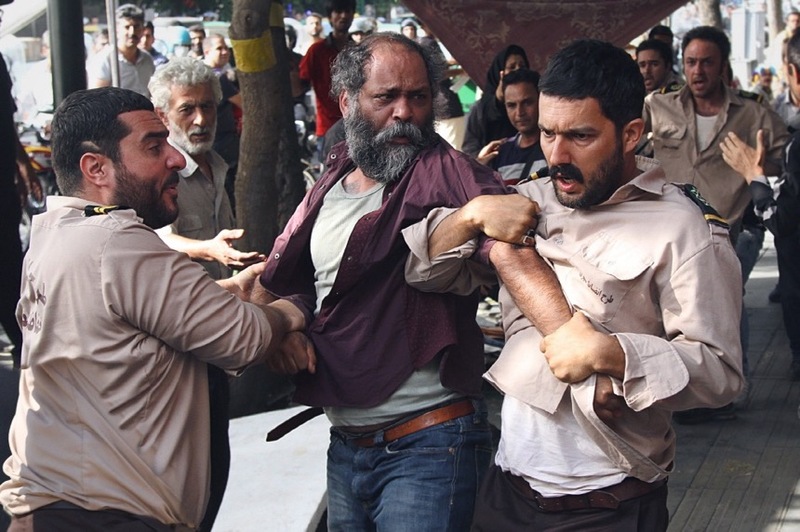 During its lean 82-minute running time, Blockage touches on many different socio-political issues affecting the working classes in Iran. Qasem’s every thought and action is motivated by money and how he can better himself, regardless of how it impacts his victims, colleagues or family members. Different generations of his family involve themselves in every aspect of his life, while his wife struggles to take control of her own future - and money - in a society where men still have the upper hand. Written by acclaimed filmmaker Saeed Roustayi (Life+1Day) and directed by Mohsen Gharaie (Don’t be Tired! ), Blockage moves at a kinetic pace, stacking layer upon layer of suffocating problems upon its protagonist, imprisoning him in a cell of his own making. There are elements of film noir in the way the story unravels, especially after a bag of cash is introduced into the mix, and Nargess shores up her position with a startling revelation. Hamed Behdad gives a captivating performance as Qasem, a deeply flawed and selfish human being, who is almost guaranteed to make the wrong decision at every turn. Behdad instills just enough sympathy in Qasem to keep the audience engaged, if not exactly on his side, as his fate hangs in the balance from first frame to last. Nadar Fallah offers excellent support as the street vendor, whose motives are never quite as obvious as they appear, while Baran Kosrari is a formidable presence as Qasem’s no-nonsense, long-suffering wife. Mohsen Kiaie is equally good as Qasem’s partner, Mehdi, struggling - and mostly failing - to keep his friend on the straight and narrow. Blockage is just the latest in a long line of contemporary Iranian dramas whose tightly woven narratives succeed both in pulling the veil back on life in modern-day Iran, while simultaneously transcending their cultural roots to tell universal stories of desperate individuals just trying to get by. The results are engrossing, despairing and all-too-familiar.